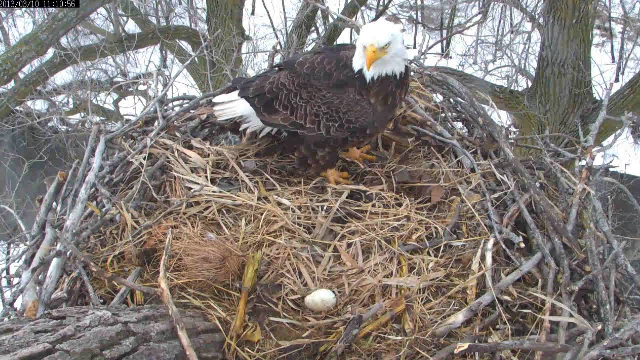 Nest Update June 20, 2013 - Branch And FledgeWatch Begin! We are going on BranchWatch and FledgeWatch starting tomorrow, Friday June 21st. 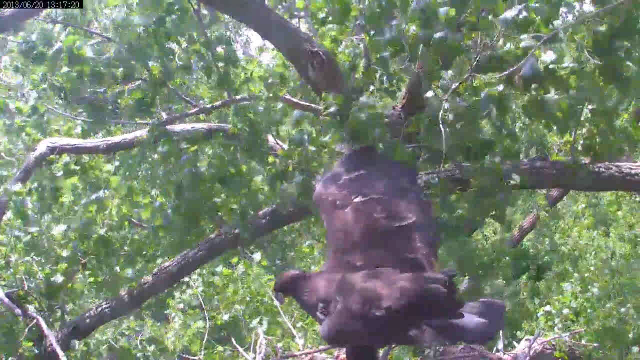 The kids are getting so good at hovering and wingersizing that they could branch at any time. Some have stated that the trunking Peace did yesterday was really a branching. We like to think of branching as that leap into the unknown to a place they have never been before. Seems more adventurous that way. The tree trunk is their buddy and hiding place from the wind. But, to each their own. The day on the nest started with a late breakfish of gosling? that Peace scored a clean takeaway and a perfect mantle on. Harmony didn’t let that last too long as she scored her own takeaway from Peace. Mom visited for a few minutes while they were eating and left quickly. She returned a few minutes later with another avian entree’ for the kids. They both had a really good breakfish. Early afternoon BBC treated us to some panning that tried to follow Harmony as she hovered. The effort was pretty amazing as Harmony bounced up and down flapping those huge wings of hers. Thanks, BBC! The rest of the afternoon was taken up by flaps, naps and guard duty. The kids found a spot off camera to hide in and scare the chatters into thinking they had left the nest. You could hear Peace and Harmony giggling at the comments in SS or maybe they were just squeeing for more food. Mom delivered a huge tasty fishy early evening and all three of them proceeded to nosh down dinner. Peace and Harmony threw a couple of elbows and body shots during dinner but all in all it went pretty peacefully. As darkness fell one was hiding in the corner and one was standing guard. They switched a couple of times just to keep us confused as to who was where. It looked to be a lovely MN sunset again this evening. On to the pics and vids! Harmony gets the cam gnomes to follow her hovering. Wonder if that was in her contract?? Not to be outdone, Peace get some exclusive close-ups. A snack fish is delivered mid afternoon and Harmony has to wait her turn to eat again. Ok, so no Fritos. Got any Oreo's?? Jeeez, you two! Back off! Dinners here!! Your boss and HIS boss are behind you today! Can't you let me win a takeaway?? Just once?? Please?? Wheeee! I can see Shakopee from up here! And a retro pic of the day from March 10th. Harmony's first day as an egg. A flip of the fishtail to Razzle and BBC for the great vids, pics and panning today! Thanks! Hope you had a wonderful last day of spring today. Summer officially starts at 1:04am Friday morning. Wish I was at Stonehenge to see the magic moment as the sun rises. Oh well, the nest is the next best place to start a new season! Have a great Friday and well see you on the nest!